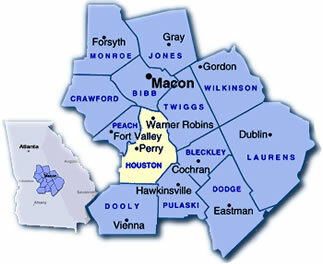 Located in Houston County, Warner Robins is one of the fastest growing cities in Georgia. The hustle and bustle of expansion and new businesses can be seen everywhere. Warner Robins is home to the Air Logistics Center, Robins Air Force Base, Georgia's largest industrial complex and one of only three such centers in the nation. Robins AFB is situated on 8,435 acres and contains more than 14 million square feet of maintenance, administrative and storage facilities. Currently, the Robins AFB employs more than 27,020 civilian service workers, military members, contractors, and non-appropriated fund employees. When in Houston County, be sure to visit the Museum of Aviation, the fourth largest aviation museum in the United States. Located on forty-three acres, the museum has over ninety historical aircraft in its collection focusing on the history of the U.S. Air Force as well as more than 200,000 square feet of exhibits. Are you planning a military move? Fickling & Company offers a military relocation packet to help you in your new transition.